Unassuming from the outside, Greenwich Village’s Minetta Tavern is one of Manhattan’s hotspots. A favourite over the years, the restaurant is seeped in literary history (the likes of Ernest Hemingway and Dylan Thomas were fans). Nowadays, the doorman who stands formidably in the doorway is the only clue that this is more than a mere restaurant – it is just as tricky to get into than a club and sometimes takes months to book a table for a good slot. 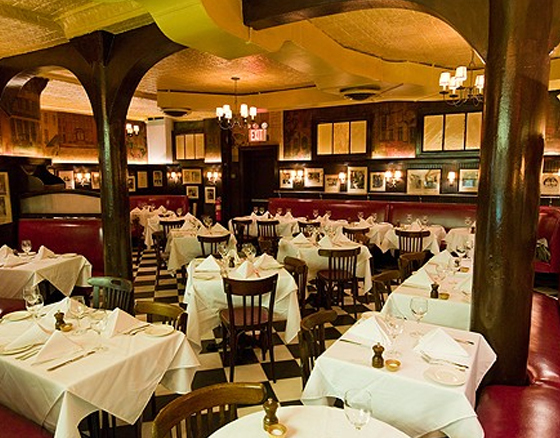 Owned by the same people who own Balthazar and Pastis (the best place to go to for a posh, Gossip Girl-esque brunch), Minetta is a little taste of Parisian bistro meets New York tavern. Despite the hype, the food is worthy. The specialty on the menu is bone marrow – a weird one for us Brits but admittedly tasty. Try the steak frites too… delicious.